Instead of just a photo and a few words, Kindra helps you create a unique vision board collage to find your perfect match. This way you don’t waste time with people who aren’t a good fit and can more easily connect with your ‘kind’ of person. Collages use themes to help you express who you authentically are. What are you looking for in a partner? For one person, personality might be most important. For someone else, it might be fitness, sexuality, values, work, or intellect. Using themes, Kindra lets you search for people based on what you most value. Too often there is a disconnect between partners and their long-term goals. Some people are looking for a partner to start or join a family. Others just want to make connections without a commitment. The signup process for Kindra asks questions not just about you and your partner preferences, but also your goals around family. Kindra lets you see who is going to local events, so you can arrange to meet organically and with low pressure at an event you were both planning to attend. Mark yourself as "attending", and you'll be able to connect with new friends after the event has ended, as well. Let us know what events you would like added to the app by emailing us at events@kindra.life. You can sign up for Kindra using either an email and password or your Facebook® account. Kindra asks you a series of question about you and your preferences and goals regarding a partner and family. Seven questions for you and partner preference are required - the rest are optional. 3. ANDROID version is coming soon! Creating a multimedia profile collage. The goal of Kindra’s multimedia profile collage is to express who you are as a person. By taking the time to create your profile, you’ll save time later. The more specific you are about yourself, the more likely you are to find a kindred connection, and not waste time with people who are not simpatico with you. Rather than providing a blank canvas, Kindra guides you to create a profile collage using “theme” attributes. For each theme, you can click on inspirations to help spark ideas for that theme. For each theme, you can upload text, audio, photo, or video. You can also add captions to your photos and videos. Try using audio and video. Your voice and style of speaking communicate a lot about you and will make you stand out on Kindra. Plus, audio and video attract more attention and engagement from other users. You can upload up to five profile pictures. Your first picture is your main profile picture. To edit your profile, click on the pencil icon in the upper right corner. This puts all the theme boxes and the profile pictures in edit mode. From this edit mode, you can change the order of your profile pictures, replace or delete the content of a theme box, and edit captions. Since searching is done by theme, you need to fill at least one theme box in order to be seen by others. To start, try the fun and easy “emoji” theme. Discovering potential partners using themes. Kindra enables you to search using the attributes or themes most important to you. Pick a theme to see how potential partners have expressed themselves using that theme. 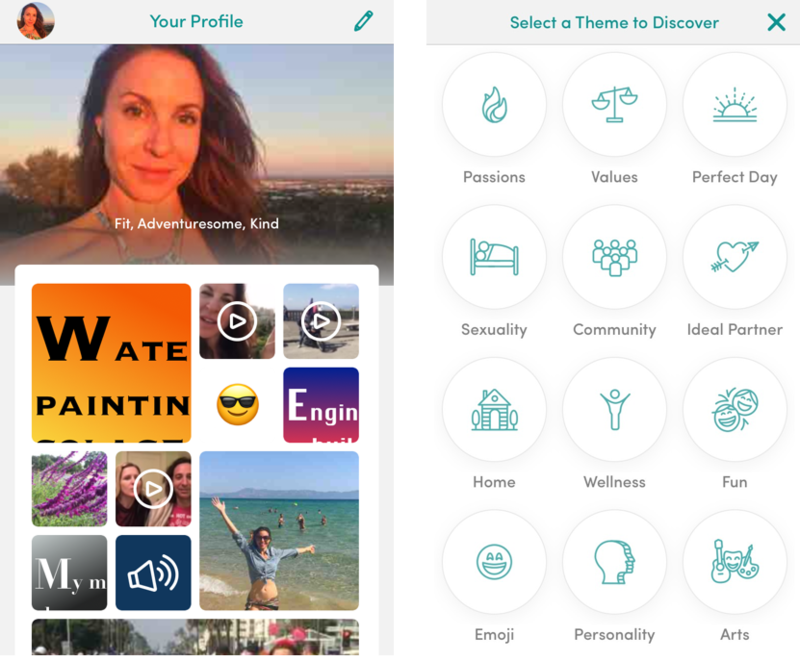 From the theme response, you can click through to the full profiles to explore what a potential partner has shared on up to 11 different themes. When looking at a theme response or a full profile, Kindra lets you like, bookmark, or remove a prospect. When you like someone, you will be prompted to send a first message. Write something fun, flirty, and/or thoughtful that shows you have explored their profile. Asking a question based on their profile is more likely to lead to a quick response. When you bookmark someone, they will still appear to you in Discover bubbles, but now they have a colored circle around them detonating that you have bookmarked them. Lists of your likes and bookmarks are in the menu, which you can access by swiping right or pressing your thumbnail which is in the upper left corner. When a like message is answered, you are connected! That person then moves from your like list to your conversations page.